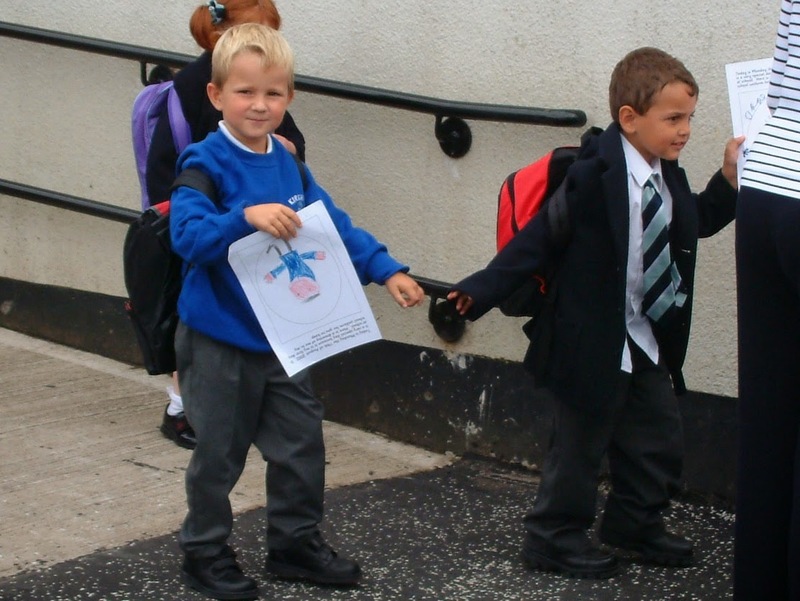 Marcel and Gregor leave school after their first day of p1. Marcel has left the building! After nearly thirteen years at school, Marcel has finally left. It's strange to watch schooling from a parents' rather than a child's perspective. I feel like my own school days took such a long time, but it's not like that when you are the parent. I remember taking the photo above as if it was yesterday. I even remember what I was wearing that day and the warm breeze that caught my skirt. I didn't feel overly tearful sending him in to school on his first day as many parents told me I would. For one thing he'd been at nursery before that, and he was so wee and eager to learn. I also knew I had another child at home. I am dreading taking Amaia in on her first day this August though as I have never done that thing that almost all my fellow parents have had to do - taking the littlest one in to start school. When I took Charlotte, I was already pregnant with Léon, with Léon, I had two babies at home, and so on. I have never walked my last one through the school doors before, so maybe that will feel different. I do admit however that I cried at his primary graduation. Primary school had been home for seven years. It had been the only stable element during a difficult few years that had seen my marriage break down and me move home twice. Of course, the primary teachers (in all their evil relish!) had taught the kids some song about moving onwards and upwards to achieve their full potential that managed to turn every last one of us to mush instantly! I knew I would be losing a part of my child then as all the mums of older pupils were positively thrilled to tell me that once they go to high school you never see them again. Of course, that wasn't quite true. I suppose to a certain extent they meant you passed in the house without touching base nearly as often. Suddenly you were no longer arranging his sleepovers and play dates, you were being called and asked 'Can I stay with X tonight, we're playing Fifa'? Of course unlike in primary days, you no longer knew X or X's parents, or you knew them vaguely, they were from a different primary but turning up at X's door to check you approved of his parents would have been seen by your child as an affront. My own house started to feel like Central Station as numerous nice wee boys camped out on my couches. So you did your own detective work, kept one ear to the ground in case there was somewhere you really ought not to want your kid spending the night and you started to back off and trust their judgement. You no longer knew where they were 24/7 - they were too old to follow round the park. You had to assume you had brought your child up well enough for him to choose the right places to be and the safest people to be with. Robert, Marcel, Matt, Gregor and others at primary graduation 6 years ago. We decided early on that if we made family dinner round the dining table compulsory, as opposed to nodding to him and allowing him to shoot off to his room with a TV dinner every night as I saw many of his contemporaries doing, we would always manage to maintain a feel for if he was ok without needing to interrogate him in an overt and intrusive manner. That worked for us. Touching base in a natural setting meant I felt I knew him well enough to trust him and he, in turn, trusted me with many truths I knew other parents were not quite as lucky to get. So high school didn't mean I lost him, it meant I got to watch him grow and mature with just about the right mix of freedom and responsibility. He excelled at school - the only child in his school to have achieved 7 Highers and one Advanced Higher by the end of s5 (7 of the 8 at A grade). He took to debating and public speaking with great relish and showed great talent in his main love: creative writing. Gregor, Euan and Marcel leave school after their last day of S6. And so yesterday, I watched as nearly 200 kids, at least 50 I'd known for 13 years, walked up and got their scrolls, their hoodies and suchlike, but more importantly I was suddenly aware of the adults they had become. Young people with the confidence to give the speeches, sing the solos, recite the poetry and conduct the ceremony itself. I was watching the tiny infants of yesterday, fully grown and ready to walk out into the world. They were so mature, capable and confident and I thank Mearns Castle for making them the wonderful young adults they have become. I can't believe I still have another 13 years to go before my last one walks out the gates. That's probably a record, but in a way I am glad my journey isn't finished yet, even if Marcel's is. I have no doubt the bunch of kids I have just watched for the last 13 years will go on to be amazing people and I wish them all, all the luck in the world. And remember Marcel, Ross, Andy, Euan, Matt, Scott, Truesy, Deeno and Robert - I've driven you so many places in the big old blue bus you did all promise me on several occasions (though possibly in a tired and emotional state) that you would look after me and drive me everywhere when I'm a pensioner - I'll be waiting! Amaia (Looking closely at my eyes): Mummy, you've got little red lines on your eyes. What is that? Amaia: Wow! And if you look closely into my eyes, can you see my brains too? It's amazing how quickly a garden can change. Yesterday I took a snapshot of which flowers and herbs were in blossom in my garden. This album shows most of what was in bloom then. 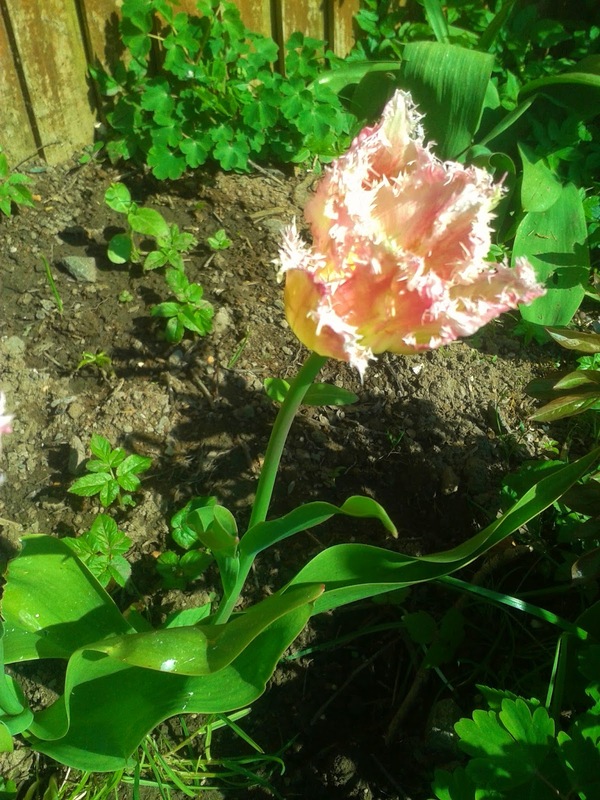 At the time I thought it might be interesting from a gardening point of view if I repeated the experiment every couple of months but I noticed that already, this morning, a new tulip had joined the ranks. Can it really be true I need to photograph my garden every single day for a year if I really want to see how it changes? We were up at Whitelee yesterday morning but none of the windmills were turning. The silence was quite eerie. When I left my first husband nearly ten years ago the last thing I wanted was any more disruption than necessary in the kids' lives. I chose, therefore, to keep them in their schools despite moving just under three miles to the next catchment along. The alternative would have been to move them away from all their friends at a time when they had already lost their home and having their parents together. For three miles, that would have been unnecessarily stressful to them. Of course, that then meant that when Léon came to go to school I couldn't be in two places at once so I sent the council a placing request to keep him with his siblings in the old school. That went fine. The pattern recurred when Anna started and now Amaia is also due to go to school. I currently have four kids in that catchment, so if Amaia's request is turned down all hell will break loose. The two schools are six minutes apart (by car) and there is no way I can be at both simultaneously. I had intended to move back into the original catchment several years ago, but this financial downturn and the varying hours of work we both get in a month has so far made that impossible. I do still hope that can one be ironed out but in the meantime I have just spent five whole months waiting for a reply from the council as to whether my already complicated life is about to become easier or hellish. It's not doing wonders for my sleep, but they have guaranteed to let me know their decision by next Thursday so the end (or the beginning) of my stress is approaching. Marcel's issue is slightly different. At least he is the master of his own destiny. He sent in several university applications last December and he was duly offered several places unconditionally. He has narrowed his choice down to two and he too has to give them his final decision by Thursday of next week. Initially he had assumed he'd go to Glasgow as that was financially less daunting, though he didn't particularly want to stay at home. Much as he loves us, he has enough life experience and maturity that he'd like to move out and become self-sufficient. I've tried living at home and in student accommodation in my day, so I know he'd have much more fun if he did move out and it would be better for his personal development (though possibly not great for my sleep patterns!) Then a couple of weeks ago Thomas and Marcel decided to spend a day in Edinburgh together, just the two of them, investigating whether that might be an option. Thomas had studied at Edinburgh more than a decade ago so was in a better position to show him round than me (my degree is from Glasgow). Marcel was very impressed with the town and the campus and has spent the last fortnight trying to work out if he could afford to fund that option instead. So I am currently awaiting both decisions, both out of my hands, wondering where the next few years will see both my kids studying. They had been playing earlier with the neighbour's daughters: Kayleigh (10) and Sophie (7). Suddenly one of Kayleigh's schoolfriends came calling and was also in their garden. Amaia: Let's go see Kayleigh and Sophie. Amaia: Oh, come on. Don't you realize all the friends you have today started out as strangers?! Not only was the quiet little one encouraging the stronger personality, she'd also hit on quite a philosophical argument for a 5 year old who isn't even in school yet. I'm still learning something new about my kids every day. They'll never cease to amaze me. Amaia: You know how some people say they don't like kids, mum? Amaia: Well that's a bit daft... Don't they remember they used to be one themselves? You can always rely on your kids to put you in your place. I'm working on an Italian dictionary project this morning, so I leave various editions open on the dining room table with my laptop, as I go to arrange the little ones' breakfast. I come back to Anna looking proudly at the contributors' page of one of them and hear her say 'Look Amaia, that's mummy's name. She helped write it!' Awwwh, my kids see there's more to me than bum-wiping, at last. But as I come in Léon looks up at me and says 'That's really impressive mummy... But you do know no one ever reads that page, don't you?' Thanks, kiddo, that's me back in my place! Anna and Amaia have been off school for ten days on holiday and have discovered a particularly hideous programme on CBBC called 'Marrying Mum and Dad'. I haven't actually seen a full episode but have walked in on them sitting almost teary-eyed at the beauty of the weddings involved. I may be wrong but as far as I can see, the format is: Mum and dad aren't married, but have kids around primary school age so the kids are tasked with arranging a themed surprise wedding for their parents. Can you imagine anything more terrifying than having, in my case, a seven year old and a five year old choosing what we'd wear, where we'd marry and all the entertainment?! In case you are in any doubt about this being a good idea, the episode I walked in on (where both my girls were looking very impressed and touched) consisted of the parents being dressed up as characters from the Wizard of Oz, the kids dressed as the lion, the tin man, etc and someone else (the person conducting the ceremony?) as the Wicked Witch of the West! We managed to grow this in the garden. 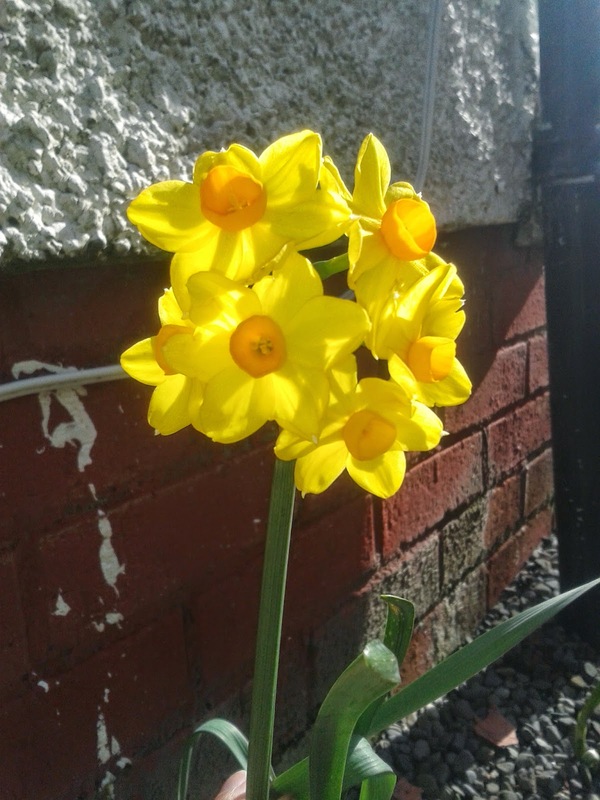 It is obviously from the daffodil family and has no less than six heads on the one stem! Isn't it pretty? And better still I got it in a reduced bag of bulbs from the bargain store. I am feeling rather pleased with myself! Why is student accommodation prohibitively expensive in Scotland? I remember when I lived on campus at Konstanz uni, paying about 25% of what I would have paid here for my room there. My boy is nearly 18 and desperate to move out of our home and spread his wings. He's been accepted for Law at both Glasgow and Edinburgh unis. He currently debating whether he should narrow that choice down to just Glasgow as that is only a two hour round-trip every day to and from our house (costing £6-50 a day) because realistically where is he going to find £130 a week for a student room on campus? Given his course is 5 years long, running up a bill of £28100 in accommodation (before you start calculating books, travel and the rest) is madness. Of course, if we lived further away, he'd be forced to take on that debt, just as English kids have no choice but to take on the crazy debt their student fees incur, but when it is optional, it really is hard to justify burdening your future by starting out in life with such a huge millstone round your neck. At the moment, over and above his school work, he is working afternoons in a café and evenings in a restaurant to try to build up some cash to move out, and he's lucky to have found a job paying £5-90 an hour (his friends are working for £3-79). But I wonder how realistic continuing that will be once he's studying too. He certainly won't be able to continue working 30hrs/wk. Working with those figures, he'll only be able to move out if he manages to work 900 hours every summer for the next five years (which is approximately 75hrs/wk! ), or if he takes on huge student loans. It's such a shame. 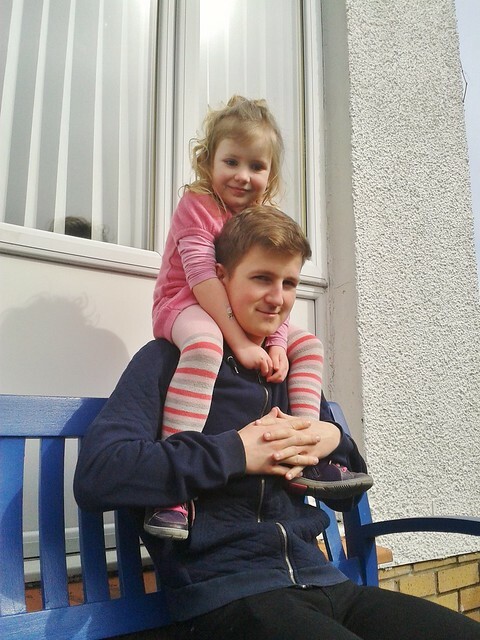 I know he'd have a much better time living at uni than squashed in our wee house with the six of us, especially as we have one bedroom too few. I guess, if I am being realistic, the time has come to consider losing our TV room, and creating a room for Léon. Braces are starting to stress me out and I've never even had any! Marcel had braces for three years and simply got on with it. Afterwards, they took them out and he started wearing a retainer instead. Everything was sorted, nothing went wrong. So when Lots got braces two years ago, I was not prepared for the drama involved. From the first few weeks of tears and not eating as she sat crunching painkillers, to the braces popping off and needing repaired over and over, to her gagging and struggling every time they made a mould of her teeth, to her refusing solid food two days a month every time they were tightened and so on. This week they finally took them off and I sighed a huge sigh of relief... too soon. Thirty-six hours on and the retainers (that she has to wear 24/7 for the first three months) have shredded her tongue and gums, she's fiddling with the bottom retainer and claiming she can't keep it in for more than a couple of minutes at a time. I can see her green eyes shining with preparatory tears once again. At home she stuffs her cheeks full of cotton wool and looks like a demented hamster to stop them rubbing against her jaw. I am slowly concluding that Charlotte's inner mouth is much more sensitive than Marcel's - well either that or she's a drama queen and he's a trouper. Either way, I am stressed to breaking point with her following me around on the verge of tears hoping 'mummy can make it all better' - sigh!